Sport from childhood. Soccer is a team sport, and has social importance. Sport originated as a leisure activity and has evolved, in many cases, into a fierce, competitively-played activity which has risen to the top of the global popularity chart. All sports are governed by a set of rules or customs that ensure that the integrity of the sport is not compromised. Sports commonly refer to activities where one's physical ability will propel one to be victorious; however, the mental aspect (for example, toughness) is also crucial in any sport. 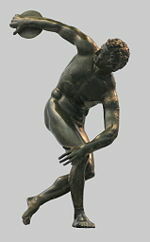 The term,"Sport" comes from the old French desport meaning "leisure"
Roman bronze reduction of Myron's Discobolos, second century C.E. There are artifacts and structures that suggest that the Chinese engaged in sporting activities as early as 4000 B.C.E. Gymnastics appears to have been a popular sport in China's ancient past. Monuments to the Pharaohs indicate that a number of sports, including swimming and fishing, were well-developed and regulated several thousands of years ago in ancient Egypt. Other Egyptian sports included javelin throwing, high jump, and wrestling. Ancient Persian sports such as the traditional Iranian martial art of Zourkhaneh had a close connection to the warfare skills. Among other sports that originate in Persia are polo and jousting. A wide range of sports were already established by the time of the rise of Ancient Greece; the military culture and the development of sports in Greece influenced one another considerably. Sports became a prominent part of their culture, leading to the creation of the Olympic Games, which in ancient times were held every four years in a small village in the Peloponnesus called Olympia. Sports have become increasingly organized and regulated from the time of the Ancient Olympics. Industrialization has brought increased leisure time to the citizens of developed and developing countries, leading to more time for citizens to attend and follow spectator sports, greater participation in athletic activities, and increased accessibility. These trends continued with the advent of mass media and global communication. Professionalism became prevalent, further adding to the increase in sport's popularity, as sports fans began following the exploits of professional athletes through radio, television, and the internet, as well as enjoying the exercise and competition associated with amateur participation in sports. Prehistoric cave art discovered in France, Africa, and Australia, carbon dated up to 30,000 years ago, provides evidence of ritual archery. The art's very existence demonstrates interest in skills unrelated to the functional tasks of staying alive, and is evidence of leisure time. It depicts other non-functional and apparently ritual activities as well. Captain Cook, as the first Western visitor to the Hawaiian Islands, in 1778, reported on the native people surfing. The Native Americans engaged in games and sports, such as lacrosse-type games, foot racing, and other athletic activities before the coming of Europeans. The ancient Mayan and Aztec civilizations played organized, ritualized ballgames. Some of the courts used at that time are still standing today. Individual sports, such as wrestling and archery, have been practiced worldwide since ancient times. Sport has been increasingly organized and regulated from the time of the Ancient Olympics up to the present century. Activities necessary for food and survival became regulated activities done for pleasure or competition on an increasing scale. Monuments to the Pharaohs of Ancient Egypt indicate that a range of sports were well-developed and regulated several thousands of years ago, including swimming and fishing. This is not surprising, perhaps, given the importance of the Nile River in the life of Egypt. Other sports included javelin throwing, high jump, and wrestling. As in Ancient Greece, the nature of the sports popular at the time suggests close correspondence with everyday non-sporting activities. There are artifacts and structures which suggest that Chinese people engaged in activities which meet our definition of sport as early as 2000 years B.C.E. The origin and development of China's sports activities seem to have been closely related to the production, work, war and entertainment of the time. Gymnastics appears to have been a popular sport in China's past. It certainly remains so today, as the skill of Chinese acrobats is internationally recognized. China has a Beijing Museum which is dedicated to the subject of Chinese sport and its history. A wide range of sports were already in operation at the time of the ancient Greeks. Wrestling, running, boxing, chariot racing, javelin and discus throwing were prevalent, and there were ball games for children and adults. This suggests that the military culture of Greece was an influence on the development of its sports. Sporting competitions are described in the Iliad, one of the most important books of ancient Greek culture. Various competitions were held in honor of Patroclus' death. The Olympic Games were held every four years in Ancient Greece. In the noble Grecian ideal, victory at the Games was much sought after and was rewarded with an olive branch. Winners at the Games were often received with much honor throughout Greece and were often granted large sums of money, particularly in their home towns. The games were held not simply as a sporting event, but as a celebration of individual excellence, cultural and artistic variety, and a showplace for architectural and sculptural innovation. Fundamentally, it was a time of gratitude and respect for the Gods of the Greek religion. The games are named after Mount Olympus, a sacred place where the Gods were said to live. A time of truce was declared during the Olympic Games, as military actions and public executions were suspended. This was to enable people to congregate peacefully and to compete in a civilized and respectful atmosphere. Archaeologists have dated the earliest ballcourts in Mesoamerica to 1600 B.C.E. The ball game was an extremely important part of ancient Mexican society, as testified by [Olmec]] statues that depict chiefs and important men wearing ballplaying gear such as helmets and padded clothing around 1200 B.C.E. The most important Classic Maya legend, the story of the Popul Vuh, centers around a pair of Hero Twins who play ball against the Lords of the Underworld. The Mesoamerican ball game had important symbolic associations, but also had more mundane functions—facilitating the celebration of holidays and gambling. There were four types of Roman sports: Ludi (chariot racing, equestrian sports, boxing), munera (gladiatorial sports and wild beast shows), Greek-style athletics (foot race, pentathlon), and recreation sports which were (apparently) not professional, such as ludi pilae (ball games). In the twenty-first century, the opportunity to participate in sports is limitless. There are a myriad of sports for different kinds of people. Beginning simply as a leisure activity, sport has evolved into a well-developed recreational pursuit as well as a huge professional business. Whether it is cricket in India, or basketball in the United States, spectators are watching these sports on television at an exponentially rising rate. Certain sports, for example basketball, are taking their organization, the National Basketball Association to global heights in their "Basketball Without Borders" program. What once began as rugby has transformed itself into one of the globe's most watched sports. With stadiums built to seat an average of seventy thousand fans and some exceeding one hundred thousand, football has the greatest turnout of any sport. The violent tackles and quarterback sacks coupled with interceptions and exciting touchdowns have made football the most popular American game and the National Football League the most popular professional sports league. The object of the game is to score points by advancing the ball to the opponent's end zone for a touchdown, or to kick field goals, and to prevent the other team from doing likewise. The team with the most points when time has expired wins. The game begins with a coin toss as the winning team chooses whether they would like to receive the ball or begin with a kickoff. The team with the possession of the ball is given four chances (downs) to make a first down. The main options of scoring are the touchdown and the field goal, while you can also give up the ball by fumbling or throwing an interception. This sport is played on all levels: High school, college, amateur, and professional. 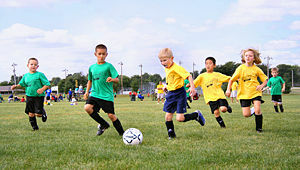 In addition, it is one of the most played leisure sports by younger children. Basketball is a team sport in which two teams of five active players each try to score points against one another by throwing a basketball through a 10-foot high hoop (the basket) under organized rules. It was created by James A. Naismith in 1891 in Springfield, Massachusetts. Basketball is one of the most popular and widely viewed sports in the world. There are professional and amateur basketball leagues in many countries and it is one of the most popular of Olympics sports as well. Like other team sports, basketball stresses not only athletic agility but also team work and competition. Points are scored by passing the ball through the basket from above; the team with more points at the end of the game wins. The ball can be advanced on the court by bouncing it (dribbling) or passing it between teammates. Disruptive physical contact (fouls) is not permitted and there are restrictions on how the ball can be handled. The National Basketball Association (NBA) is the world's premier men's basketball league. It has 30 teams; 29 in the United States and 1 in Canada. It is an active member of USA Basketball (also known as FIBA), which is recognized by the International Basketball Federation as the National Governing Body (NGB) for basketball in the United States. The league was founded in New York City, on June 6, 1946, as the Basketball Association of America (BAA). The league adopted the name National Basketball Association in the Autumn of 1949, after merging with the rival National Basketball League (United States). The NBA represents the highest level of competition in the world of basketball. It has grown in international popularity as the best players of the world have joined America's top players. one of the more physical sports, is one of the four major professional sports, and is represented by the National Hockey League (NHL) at its highest level. The sport itself is played on numerous levels, including men and women's NCAA hockey, men and women's national hockey league, and so on. What arose as a pastime in Canada has become popular in almost all parts of the world, especially the colder areas, where hockey can be played outdoors on ice. In fact, Canadian hockey comprises of six teams of the NHL, and the number of Canadian players in comparison to Americans is approximately four to one. The sport's popularity in the U.S. is concentrated in certain regions, notably the Northeast, the Midwest, and Alaska. This concentration helps to make ice hockey the least watched major sport in the United States, though it is by far the most watched sport in Canada. Nonetheless, in certain major U.S. cities like Buffalo, Detroit, Pittsburgh, Minneapolis, Chicago, Boston, New York, Philadelphia, Tampa Bay, Denver, San Jose, and Columbus it commands popularity levels similar to and occasionally exceeding basketball for winter sports fans. The NHL was founded in 1917 in Montreal, Quebec, Canada, with only four teams. Through a series of expansions, contractions, and relocations, the league is now composed of 30 teams, 24 of which are based in the United States and six in Canada. After a labor dispute that led to the cancellation of the complete 2004–05 season, the league has staged a successful comeback, including revenue and profit growth. As a result of the Canadian influence, the majority of the hockey league consists of players of Canadian descent. Golf is a sport in which individual players or teams of players strike a ball into a hole using several types of clubs. Golf is one of the few ball games that does not use a fixed, standardized playing field or area; defined in the Rules of Golf as "playing a ball with a club from the teeing ground into the hole by a stroke or successive strokes in accordance with the Rules." The Royal and Ancient Golf Club of St Andrews The first game of golf for which records survive was played at Bruntsfield Links, in Edinburgh, Scotland, in A.D. 1456, recorded in the archives of the Edinburgh Burgess Golfing Society, now The Royal Burgess Golfing Society. As one of the most popular sports in the world, soccer is a team sport that consists of eleven players vying to kick the ball past the goalie and into the net. In terms of scoring, soccer generates the fewest points (goals); however, game play is more intense and physical than in many sports. There is almost never a rupture in the action, and upon scoring a goal, the fans break into a frenzy that can rarely be matched by other sports. Tennis is a game played between two players (singles) or between two teams of two players (doubles). Players use a stringed racket to strike a hollow rubber ball covered with felt over a net into the opponent's court. Originating in Europe in the late nineteenth century, tennis spread first throughout the English-speaking world, particularly among the upper classes. Tennis is now once again an Olympic sport and is played at all levels of society, by all ages, and in many countries around the world. Except for the adoption of the tie-breaker in the 1970s, its rules have remained remarkably unchanged since the 1890s. Along with its millions of players, millions of people follow tennis as a spectator sport, especially the four Grand Slam tournaments: Australian Open, French Open, Wimbledon, and the U.S. Open. Volleyball is a globally recognized sport that originated in the United States. Play is started by a player on one side serving the ball over the the net into the opponents' field or court. The opponents then, without allowing the ball to strike the floor, return it, and it is in this way kept going back and forth until one side fails to return it or it hits the floor. This counts a "score" for one side, or a "server out" for the other, depending on the side in point. The game consists of nine innings, each side serving a certain number of times, as per the rules, per inning. The complete rules of volleyball are extensive, but in general, play proceeds as follows. Points are scored by grounding the ball on the opponents' court, or when the opponent commits a fault. The first team to reach 25 points wins the set and the first team to win three sets wins the match. Teams can contact the ball no more than three times before the ball crosses the net, and consecutive contacts must be made by different players. The ball is usually played with the hands or arms, but players can legally strike or push (short contact) the ball with any part of the body. There are numerous sports that are played frequently and are in demand in terms of popularity and appeal. These include cricket, lacrosse, rugby, fishing, horse racing, and water polo, among others. Sportsmanship is an attitude that strives for fair play, courtesy toward teammates and opponents, ethical behavior and integrity, and grace in losing. Sportsmanship expresses an aspiration or ethos that the activity will be enjoyed for its own sake. The well-known sentiment by sports journalist Grantland Rice, that it is “not that you won or lost but how you played the game," and the Modern Olympic creed expressed by its founder Pierre de Coubertin: "The most important thing … is not winning but taking part" are typical expressions of this sentiment. People responsible for leisure activities often seek recognition and respectability as sports by joining sports federations such as 5 IOC, or by forming their own regulatory body. In this way, sports evolve from leisure activity to more formal sports: Relatively recent newcomers are BMX cycling, snowboarding, and wrestling. Some of these activities have been popular but uncodified pursuits in various forms for different lengths of time. Indeed, the formal regulation of sport is a relatively modern and increasing development. Sportsmanship, within any given game, is how each competitor acts before, during, and after the competition. The challenge of huge monetary rewards, as sport has become a big business, has made some impact on the notion of sportsmanship. Still, each sport has its own definition of what counts as good sportsmanship, informal rules which are to be obeyed. Failure to do so usually results in criticism or even a fight. For example, in football it is considered sportsmanlike to kick the ball out of play to allow treatment for an injured player on the other side. Reciprocally, the other team is expected to return the ball from the throw-in. Ice hockey players traditionally don't take a shot after the whistle blows. Doing so could lead to retaliation. Modern sports have complex rules and are highly organized. At times, sports and politics can have a large amount of influence on each other. When apartheid was the official policy in South Africa, many athletes, particularly in rugby, adopted the conscientious approach that they should not appear in competitive sports there. Some feel this was an effective contribution to the eventual demolition of the policy of apartheid, others feel that it may have prolonged and reinforced its worst effects. The 1936 Summer Olympics, held in Berlin, was an illustration, perhaps best recognized in retrospect, of a political ideology using an event for propaganda purposes. The 1980 Olympics were boycotted by the United States in response to the Soviet invastion of Afghanistan. The Soviets retaliated, boycotting the 1984 Games in Los Angeles. In modern sport motorization has appeared. In the history of Ireland, Gaelic sports were connected with cultural nationalism. Until the mid twentieth century, a person could have been banned from playing Gaelic football, hurling, or other sports administered by the Gaelic Athletic Association (GAA) if she/he played or supported soccer, or other games seen to be of British origin. Until recently the GAA continued to ban the playing of soccer and rugby at Gaelic venues. This ban is still enforced, but has been modified to allow football and rugby be played in Croke Park while Lansdowne Road is being redeveloped. Until recently, under Rule 21, the GAA also banned members of the British security forces and members of the RUC from playing Gaelic games, but the advent of the Good Friday Agreement, in 1998, led to the eventual removal of the ban. Nationalism is often evident in the pursuit of sports, or in its reporting: People compete in national teams, or commentators and audiences can adopt a partisan view. Usually, the result is good, clean competition. However, on occasion, such tensions can lead to violent confrontation among players or spectators within and beyond the sporting venue (see Football War). These trends are seen by many as contrary to the fundamental ethos of sports being carried on for its own sake and for the enjoyment of its participants. Sports have many affinities with art. Ice skating and Tai chi, and Dancesport for example, are sports that bear similarities to artistic spectacles. Similarly, there are other activities that have elements of sport and art in their execution, such as artistic gymnastics, Bodybuilding, Parkour, performance art, Yoga, bossaball, dressage, culinary arts, etc. Perhaps the best example is Bull-fighting, which in Spain is reported in the arts pages of newspapers. The fact that art is so close to sports in some situations is probably related to the nature of sports. Sport, like art, has a utilitarian purpose, but is also pursued for its own sake, for beauty and enjoyment. Art and sports have been clearly linked since the time of Ancient Greece, when gymnastics and calisthenics invoked admiration and aesthetic appreciation for the physical build, prowess and "arete" displayed by participants. The modern term "art" as skill, is related to this ancient Greek term arete, which roughly translates as excellence. The closeness of art and sport in these times was revealed by the nature of the Olympic Games which, as we have seen, were celebrations of both sporting and artistic achievements, poetry, sculpture, and architecture. As well as being a form of recreation for the participants, much sport is played in front of an audience. Most professional sport is played in a 'theater' of some kind–a stadium, arena, golf course, race track, or the open road, with provision for the (often paying) public. Large television or radio audiences are also commonly attracted, with rival broadcasters bidding large amounts of money for the 'rights' to show certain fixtures. The football World Cup attracts a global television audience of hundreds of millions; the 2006 Final alone attracted an estimated worldwide audience of well over 700 million. In the United States, the championship game of the NFL, the Super Bowl, has become one of the most watched television broadcasts of the year. Super Bowl Sunday is a "de facto" national holiday; the viewership is so great that in 2007 advertising space was reported as being sold at $2.6m for a 30 second slot. Sports in general are a medium through which many experience stress relief, and furthermore, a way through which a conglomeration of cultures can become unified. "Sports affect politics, fuel our economy, and shape our culture. The American Dream is personified in our champions, in the records they set and the barriers they break. The dynamic interaction of athletes, fans, and the media produces inexplicable loyalties, lasting legends, and revered heroes. The greatest champions stand for more than the records they break. They stand for the barriers they shatter—physical, social, psychological, racial, cultural—and change the way we think about our world." "John L. Sullivan fought his way to the heavyweight championship and charmed his way to truly national celebrity. The bare-knuckle prizefighter personified the masculine, aggressive spirit of the era, and the fans who loved him vastly outnumbered his detractors. Though boxing was illegal in most states, the press-savvy Sullivan won fans from every walk of life, including the president of the United States. At the high point of his career, Sullivan's supporters bought him a diamond-encrusted belt which was presented to him by the mayor of Boston. "The Great John L." lost only one of his nearly 50 career fights, falling to James "Gentleman Jim" Corbett in 1892." Gertrude Ederle was the first woman to swim the English Channel. ↑ Chinese Culture, Sports History in China. Retrieved November 24, 2007. ↑ IOA, Mr Ahmed D. Touny (EGY), IOC Member. Retrieved November 24, 2007. ↑ Kuwait info, Persian warriors. Retrieved November 24, 2007. ↑ The Olympics, Ancient Olympic Games. Retrieved November 24, 2007. ↑ Merriam Webster, Sportsmanship. Retrieved November 24, 2007. ↑ Blackwell Synergy, Sport and apartheid. Retrieved November 24, 2007. ↑ 7.0 7.1 7.2 7.3 7.4 7.5 Sports Illustrated, Sports: Breaking Records, Breaking Barriers. Retrieved November 24, 2007. Hickock, Ralph. The Encyclopedia of North American Sports History. New York: Facts on File, Copyright 1992. ISBN 9780816020966. Mandel, Michael. The Meaning of Sports. PublicAffairs. ISBN 1-58648-252-1. Menke, G. Frank. The Encyclopedia of Sports. South Brunswick: A.S. Barnes, 1975. ISBN 9780498014406. This page was last modified on 17 October 2015, at 15:11.